Despite enjoying nine successful seasons with the Arizona Cardinals, who drafted him in the second round in 2008, Campbell said bluntly on Tuesday that it’s just another game. Yet, Campbell, 31, says he looks forward to seeing some of his former teammates, especially wide receiver Larry Fitzgerald. Perhaps, no free agent has made a bigger splash this season than what Campbell has done so far in Jacksonville. He is tied for the NFL lead in sacks with Dallas’ DeMarcus Lawrence with 11.5. 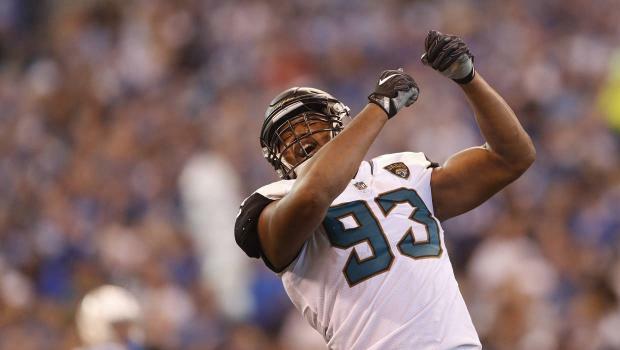 Behind Campbell’s presence, the Jaguars are allowing just 276.6 total yards and yielding 14.1 points per game. Both rank first in the league. At 6-feet-8, 300 pounds, Campbell has been strong enough to bull-rush through blocks for sacks and tackles. Campbell, who has not missed a game this season, has made 39 tackles, which is the fifth-highest on the team. Off the field, Campbell’s strong leadership skills have impacted the entire Jaguars’ locker room. “You can see from a professional standpoint that he’s a true pro and you just look at him and the way he approaches the game and he goes out there and translate it,” safety Tashaun Gipson said. Last week before playing the Browns, Gipson boasted that Jaguars were going to shut out his former team and that Cleveland would probably go 0-16 for the season. The Jaguars didn’t achieve a shutout but they pulled out a 19-7 victory under rain and snowy conditions to improve to 7-3 and take sole possession of first place in the AFC South. It is the first time they are leading their division entering Week 12 since 1999. Campbell said he doesn’t have any ill feelings toward the Cardinals, although they did not make a strong push to re-sign him. Instead, the Cardinals decided to lock up linebacker Chandler Jones, who signed five-year, $83 million contract in March after deciding to couldn’t afford to keep both players. Campbell achieved seven or more sacks during three of his final four seasons with the Cardinals.